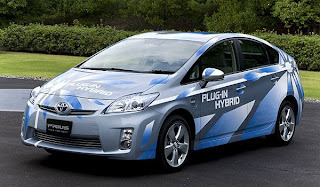 Toyota will mass-produce lithium-ion batteries for its upcoming plug-in hybrid electric vehicles starting this autumn, the Nikkei business daily reported. The news comes less than a month after a report that said the batteries for the PHEVs were planned, but no date was given. The newspaper, citing Toyota spokeswoman Shiori Hashimoto, said the automaker's first-ever production lines for lithium-ion batteries at its plant in Aichi Prefecture and at a factory operated with Panasonic in Shizuoka Prefecture are expected to cost the carmaker $120 million. The two facilities combined will make batteries for about 100,000 PHEVs a year, the Nikkei said. Toyota plans to sell these vehicles in Japan, the United States and Europe at the start of 2012, the newspaper said. Hashimoto declined to say how many of its own lithium batteries Toyota planned to make. Lithium-ion batteries are widely seen as more suitable for electric-drive vehicles than, say, the nickel-metal hydride batteries currently found in the Prius, but high costs to date have stymied their widespread use.